VoiceOver. The talk of the music world. VoiceOver is a remarkable new feature of the new iPod shuffle. It completely changes the way you interact with your music. And it does it so seamlessly, you’ll be surprised at how brilliant it is. 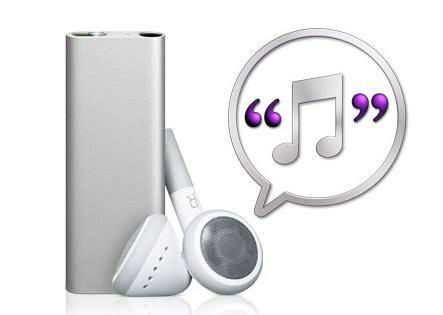 VoiceOver is the exciting new feature that makes iPod shuffle the first music player that talks to you. It entirely changes the way you browse and navigate your music. Say you’re listening to a song and want to know the title or the artist. With the press of a button, VoiceOver tells you without interrupting your music.But the fun doesn’t stop with songs. For the first time ever on an iPod shuffle, you can have multiple playlists, because VoiceOver announces their names, too. So you can easily find the right mix without taking your eyes off your run, your ride, or whatever you’re doing. You’ll notice how smoothly and easily VoiceOver works. A lot of thought has gone into creating an iPod shuffle that not only talks, but says the right things. It all begins with iTunes and its seamless integration with iPod. iTunes reads your song information, then uses the new VoiceOver Kit to generate the announcements for the songs, artists, and playlists on your iPod shuffle. You’ll hear different voices depending on what type of computer system you use when you sync your iPod shuffle. If you sync your iPod shuffle with a PC or with a Mac running Mac OS X Tiger, you’ll hear the English voice included in the VoiceOver Kit. And since Mac OS X Leopard already has an amazing English voice built in, that’s the one you’ll hear when you sync your iPod shuffle with a Mac running Leopard. Your music library has songs from all over the world — a love song from France, a bolero from Spain, or a pop tune from Japan. Luckily, VoiceOver speaks fluent song — in 20 languages, to be exact. iTunes automatically selects the language and best voice for your song titles and artist names. It looks at song data, like the title, artist, and album information, then applies intelligent algorithms to choose the right language. For example, iTunes recognizes the song “Ya Viene el Sol” by Ozomatli as a Spanish song, so your iPod shuffle will automatically speak that song title and artist in Spanish. If you’d prefer to hear that information spoken in another language, you can change the designated VoiceOver language for that song in iTunes.